A ravaged wood, a man in uniform long dead - this is not a World War One battlefield but Wanwood House, a pharmaceutical research centre. Peter Pascoe attends his grandmother’s funeral, and scattering her ashes leads him, too, into war-torn woods in search of his great-grandfather, who fought and died in Passchendaele. Seeing the wood for the trees is the problem for Andy Dalziel when he finds himself fancying an animal rights activist depite her possible complicity in a murderous assault and her appalling taste in whisky. A mind-bending puzzle leading us on the wild side of the pastoral. I have read and/or listened to all the Dalziel Pascoe books over and over. 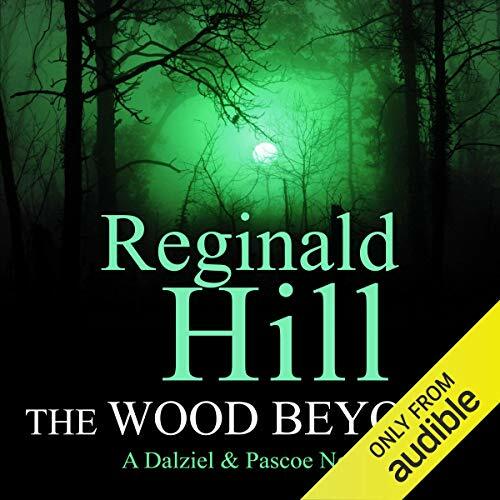 I had read The Wood Beyond just once, and wondered when I saw it offered on Audible, why I never picked it up again. Having listened to this audio version, now I know why. Its slow, not at all exciting, and most of the book is spent on Peter Pascoe's family history. It seems that the current narrator of the Dalziel and Pascoe series, Jonathan Keeble, is here to stay. He is fine, but just fine. He does a good Andy, Peter and Weildy. But his womens' voices are truly awful. Hope they bring back Shaun Dooley or Colin Buchanan. They are outstanding. I can't count how many times I have listened to the Dalziel/Pascoe books they narrate. If you are a fan of this great series, you can skip this book and not miss a thing. In my favorite novels, there is a mixture of past and present, good and bad, anticipation and satisfaction. Reginald Hill has such a deft touch. His books are never too salty sweet, or bitter--but just a delicious mélange that keeps me coming back for another banquet! Reginald Hill in fine form. What did you love best about The Wood Beyond? The level of detail that Reg Hill imparts is truly impressive. All the characters are well developed - you are invested right from the start. The back drop of the Pascoe family history. Keeble does a masterful job with all the characters but I guess I enjoy his Peter Pascoe the most. the narrator is very good and brings familiar characters to life. as usual Reginald Hill's facility with dialogue makes the plot almost irrelevant. wonderful use of language. His regionalisms, combine with historical and literary references to make a challenging and compelling read. I always wonder how many times I miss his nods to other authors or past events.